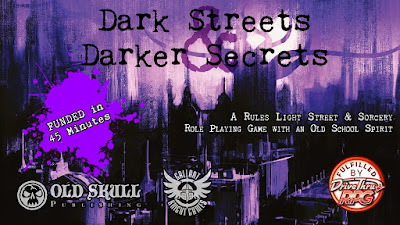 His newest creation, “Dark Streets & Darker Secrets” RPG is an “old school inspired urban horror and modern fantasy RPG. It is Kickstartering right now and ends on Wednesday (it is just a seven day Kickstarter project). Not only is the text already written, but the pdf and POD are also already completed too! But enough of my yapping. Check it out for yourself. I know many Old-School gamers find plenty of inspiration, simple and intuitive mechanics, and a lot of fun running and playing Diogo’s games. Old Skull Publishing is distributed through Galant Knight Games. Far too long in coming and not nearly as grand as I had initially envisioned, here is the final shipment of the Appendix N Kickstarter project. The tragic death of a daughter, the loss of my main cover artist to cancer, many personal setbacks, along with a lack of business skills and my willingness to be swayed by the loudest voices, I have not always made the best choices for myself or this project. I paid too much for art, added stretch goals outside of the project's scope, and even let the number of pledges grow from a what I knew I could handle to more than three times that amount. My only consolation is the hope that at least some of the parts of this project helped provide great times around your gaming table. 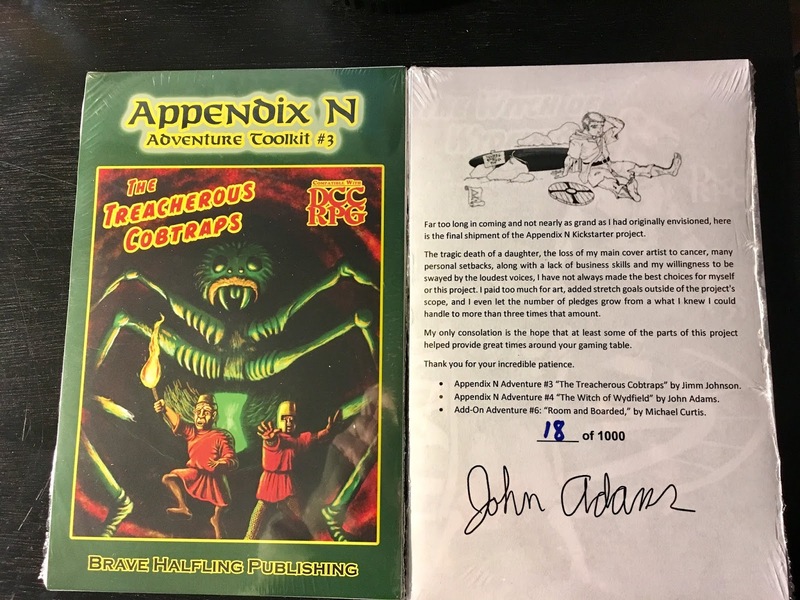 This bundle contains in print: Appendix n Adventures #3: “The Treacherous Cobtraps” Appendix N Adventures #4: “The Witch of Wydfield” Add-On Adventure #6: “Room and Boarded” by Michael Curtis. I am currently shipping to $500, $200, and $100 pledge levels as well as to those who gave extra for shipping. I will update you on the progress each Monday. Thank you for your incredible patience.